The new Red Flags Rule requires healthcare institutions to be on their toes when it comes to identifying potential identity theft. As predicted by many healthcare and security professionals, the U.S. government is continuing to take steps to enact measures that will more effectively protect consumers against fallout from security breaches and identity theft in the marketplace. The latest of these efforts to have a direct effect on healthcare institutions comes in the form of the Identity Theft Red Flags Rule, which goes into effect August 1. An outgrowth of the Fair and Accurate Credit Transaction Act of 2003, the Red Flags Rule specifically focuses on an organization’s ability to prevent identity theft and medical identity theft. Entities covered under the rules include businesses and organizations that offer credit or payment plans to consumers, including businesses as diverse as utility companies and charities. It also covers institutions, such as healthcare organizations, that allow consumers to pay in installments or require multiple transactions on a particular account, notes Sue Marre, RHIA, president of the Massachusetts Health Information Management Association and HIM director and HIPAA privacy officer at New England Sinai Hospital and Rehabilitation Center. The FTC extended its original compliance deadline from November 1, 2008, to August 1, 2009, because many entities, including healthcare facilities, were unsure as to whether they were included as a covered entity, especially because many of them had not been required to comply with the FTC’s rules in other contexts. The deadline was extended to August to give institutions time to develop and implement written prevention programs. It comes down to having a written program in place and following it, according to Apgar, who adds that if it’s not documented, then it didn’t happen in the legal world. “As a responsible healthcare organization, I may be doing the right things, but if I haven’t documented it, to an outsider, it doesn’t look like I have done anything,” he explains. The rules state that an organization must have a “program” as opposed to just a set of policies and procedures, and while many professionals are unclear as to how that will be defined, Marre points out that the key to what a program should encompass relates directly to an organization’s size. “My program here at Sinai is going to be on a much smaller scale than at Massachusetts General,” she says, comparing her 212-bed facility to that of the largest hospital in New England. Apgar says the plan is intended to cover all accounts, not just those that fall under the conditions of payment plans or multiple transactions. “The FTC has taken the stand that it doesn’t matter if it’s only 1% of accounts that fall under that definition,” he says. She adds that potential offenses could include the attempted use of a photocopied driver’s license, unusual account activity, or a suspicious address change request. Organizations are also required to provide specific procedures for detecting potential threats in their day-to-day operations. Actions could include the monitoring of people accessing patient files and noting suspicious activity in patient accounts, Gindin says. Procedures should also be in place for responding when red flags are detected. Gindin offers examples of possible responses, including ensuring that information relating to the thief is not commingled with that of the victim, contacting insurance providers to prevent further issues, and notifying the patient. Regular staff training is a requirement, as well as oversight of other service providers working with an institution. Marre notes that New England Sinai conducts regular staff development training and has put specific training for identifying red flags on the agenda for employee orientation. Other provisions in the rules call for the regular monitoring of the program’s effectiveness and a well-documented policy that is signed, administered, and managed by the board of directors. Gindin adds that the FTC wants to see documented proof that the board of directors, board committee, or managing physician is overseeing the program’s implementation and administration, which means senior stakeholders will be required to review reports regarding the program and approve any significant changes. Gindin believes most facilities, if they have adopted appropriate polices to comply with HIPAA, should be well prepared for red flag ramifications. “I suspect most already have the procedures in place, and all they will have to do is document,” she says. 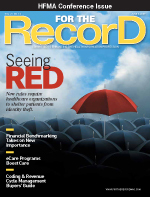 When it comes to red flag enforcement, it’s a whole new ball game compared with HIPAA—at least, that’s what many industry professionals are suggesting. When HIPAA went into effect six years ago, facilities braced themselves for fallout from the Office for Civil Rights (OCR). To date, there have been no official civil penalties levied. Gindin concurs, noting that to date, the FTC has taken more than 30 enforcement actions against violators of various privacy laws. “The penalties against violators have been as high as $10 million,” she notes. Apgar points to a recent settlement that originated as a dual investigation by the FTC and HHS of allegations that CVS Caremark pharmacies nationwide were disposing of a multitude of sensitive personal health and financial information into open dumpsters. The nation’s largest retail pharmacy chain agreed to a $2.25 million settlement and a corrective action plan to ensure it does not violate the privacy of its millions of patients. “If you have one employee throw out 12 documents and that continues, it can get very expensive very quick,” Apgar says. However, Apgar says not to expect an army of FTC investigators to begin regular compliance audits. “The FTC does not have a huge enforcement arm, but they do respond strongly to complaints and headlines,” he notes. Gindin explains that FTC enforcement is typically triggered by an event, such as a data breach or a major identity theft involving the organization. The key to the Red Flags Rule is that it is a proactive effort to identify problems before they occur, not necessarily to prevent them. “If the medical provider can demonstrate that it has had a well-documented program in place and, in spite of their program, the event took place, it is much less likely to face legal action,” Gindin says. Apgar agrees that if organizations are following the guidelines, there shouldn’t be much concern about fallout. “If my staff isn’t looking for [red flags] and taking action appropriately, then my organization will find itself in trouble,” he says. 1. Alerts, notifications, and warnings from a credit reporting company: Changes in a credit report or a consumer’s credit activity may signal identity theft such as a fraud or an active duty alert on a credit report, a credit freeze notice in response to a request for credit, or a report of address discrepancy. 2. Suspicious documents: Sometimes paperwork has the telltale signs of identity theft, including identification that looks altered or forged or the person not resembling the photo ID or matching the physical description. 3. Suspicious personal identifying information: Identity thieves may use information that contains inconsistencies. Examples include an address that doesn’t match the credit report, the use of a Social Security number that’s listed on the Social Security Administration Death Master File or a number that hasn’t been issued, a date of birth that doesn’t correlate to the number range on the Social Security Administration’s issuance tables, information that has been used on a known fraudulent account, a bogus address or invalid phone number, a Social Security number that has been used by someone else opening an account, an address or telephone number that has been used by others, a person who omits required information and doesn’t respond to notices that the application is incomplete, or a person who can’t provide authenticating information. 4. Suspicious account activity: Sometimes the tip-off is how the account is being used. Red flag patterns include nonpayment when there’s no history of missed payments, mail sent to the customer that’s returned repeatedly as undeliverable although transactions continue to be conducted on the account, information that the customer isn’t receiving their account statements in the mail, or information about unauthorized charges on the account. 5. Notice from other sources: Sometimes a red flag that an account has been opened or used fraudulently can come from a customer, a victim of identity theft, or law enforcement.